Excellent grey leaved evergreen low shrub for hot and sunny sites. To 3′ x 4′. 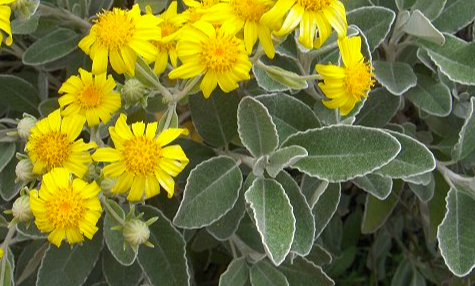 Foliage is grey on the top of the rounded leaves with a distinct white undersides. In summer clusters of brilliant yellow daisies are showy and provide excellent contrast. Best in poor to average well drained soils – accepts clay soils with little summer water. Very drought tolerant. Best in the mildest gardens. Dry hillsides, shrub borders, hot aspects. Little to light summer water. Good deer resistance. Cold hardy to about 10ºF or a little lower if soil is strictly un-amended and summer water is sparse- neglect leads to a hardier plant in the long run. New Zealand. Excellent performance at the oregon coast.